At BAM we provide brands with the unique opportunity to follow their campaign progress in real time through their own online management portal. The portal allows us and brands to view every media channel that is being utilised in a campaign, tracking it’s effectiveness and success rate. This means that we can be agile in our marketing methods and it gives us the flexibility to change our approach in real time to ensure we get the very best results. 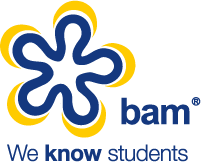 Brands can view stats and analyse results throughout the campaign in real time and also see first hand how BAM are building brand presence within the student community. When working with promotional staff communication is critical. Our Check-in tool provides our ambassadors with all the essential information they need for the campaign, whenever they need it. Whilst doing so it also provides transparency for brands to see exactly how our ambassadors our performing, which in turn promotes accountability from our ambassadors.